Posted on Sat, Feb 18, 2012 : 7:06 a.m.
Just in time for Mardi Gras, Rocco DiSpirito gives a the traditionally high-fat Cajun classic jambalaya a healthy makeover. Thanks to a zero-calorie rice-like product and various other nips and tucks, the result has lots of flavor, but not lots of calories. Mardi Gras is the sort of celebration that can make every city in America want to be New Orleans. Between the parties and parades and all those rich foods, what's not to love? Well, perhaps the after effects of all those rich foods. That's why I came up with this downsized version of jambalaya, a classic Cajun dish. I wanted to take a little of the fat out of Fat Tuesday. Jambalaya is basically a one-pot meal in which rice is a main ingredient. The trouble with rice — especially white rice — is that it is loaded with carbs and calories. To deal with that, I replace the rice in my jambalaya with a product called Miracle Rice. This is a variety of shirataki noodle, an increasingly popular variety of ultra-low calorie noodle products. Miracle Rice has no calories, no fat, no carbs and no sodium. 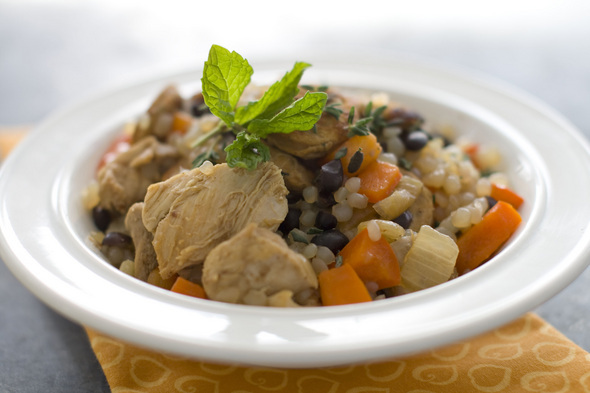 It resembles a large couscous and has an extremely mild flavor. This means it takes well to whatever other flavors you add, making it a perfect base for a high-flavor dish like jambalaya. If you can't find Miracle Rice at the grocer, it is available online. You also could substitute cooked brown rice, though this will increase the calories and carbs. The rest of this dish is built around much of the basic trinity of Cajun cooking — bell peppers, onion and celery. Chili powder provides the kick. I've trimmed the fat and calories from the protein, which usually consists of ham, sausage or duck. I use leaner chicken and turkey sausage instead. The result has just 233 calories and 8 grams of fat per serving. Traditional recipes have 16 grams of fat and 767 calories. — If you like, garnish this dish with fresh cilantro sprigs and a chopped scallion and add fewer than 2 calories per serving. — This dish gets better with time, so don't hesitate to make it up to 24 hours in advance. In a large nonstick saute pan over medium-high, heat the oil. Once the oil has started to smoke, add the chicken. Brown the chicken for 2 to 3 minutes, turning the pieces once. Remove the chicken from pan and add the sausage, browning it for about 1 minute, turning the pieces once. Add the adobo and chili powder and cook for 30 seconds. Add the onions, then reduce heat to medium-low and caramelize them slowly until soft and browned, about 6 to 8 minutes. Add the peppers and garlic and cook until soft, about another 2 minutes. Add the browned chicken, broth, Miracle Rice and black beans. Bring to a simmer. Simmer, uncovered, over medium to low heat for about 5 minutes, or until the chicken is cooked through and the sauce is slightly thickened. Season with salt and pepper and divide between 4 serving bowls. Nutrition information per serving (values are rounded to the nearest whole number): 233 calories; 8 g fat (30 percent calories from fat) (2 g saturated); 103 mg cholesterol; 13 g carbohydrate; 28 g protein; 4 g fiber; 862 mg sodium.